Samia is a distinguished lawyer, and the co-founder and chairwoman of Mutawinat, an organization that uses law as a strategic tool for positive change for women in Sudan. Mutawinat prioritizes women’s human rights, women’s rights in the constitution, and engagement of women in constitution writing. Legal reform, legal literacy, and women’s access to justice are the leading aspects of their mission. It was the first organization in Sudan to initiate legal aid clinics and legal literacy programs targeting women. Mutawinat is highly engaged in civil society implementation of the co-operation agreements between Sudan and South Sudan. 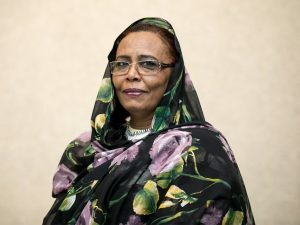 Samia is the founder of many women networks in Sudan, and is a prominent trainer and women’s rights advocate.